"Portuguese course with high entertainment factor"
One of the best software to learn Portuguese is Transparent Portuguese (Brazilian) Premium Edition because of the iTunes capability. This will allow you to progress faster as you have more time to immerse in the language and study at a time that is convenient. It was found that students are able to progress faster when they were listening while they are driving or waiting for a doctor's appointment. I decided to learn Brazilian Portuguese and not the dialect of Portugal itself because of the size and influence of Brazil and its culture. I like Portuguese because it's a Romance language and closely related to Spanish and Italian. Since I already have some experience learning the French language, there are some nasalized vowels that I can handle. Portuguese language is rarely studied but it is so important in commerce and banking that knowledge of it is a very marketable skill. The internet is a rich source of sites to help you learn Portuguese and learn more about the Brazilian and Portuguese culture. I tried learning the Portuguese grammar online and found some complete beginner Portuguese lessons with common words, learning tips, culture, and more. There are books and audio complete with coursebook with variations of common useful phrases. Some of them even have dictionaries with idioms and expressions. Some of the comprehensive course comes in audio only with cd's, audio, and reading lesson in a complete booklet. While it promises that you begin learning almost immediately as you will be learning the conversation with a native speaker, there is only a little bit of reading practice. However, since Portuguese is easy to read, some students consider this as a minor problem. Transparent Portuguese (Brazilian) Premium Edition over all other methods is the best because it uses native speaker audio, text, video, games and dialogues to immerse you in the Portuguese language. It can be integrated with BYKI. What I like best about it is the 6 month guarantee and since it's affordable, I was able to get value for my money because the teaching method is sound and effective. I felt that my ability to build a vocabulary base has rapidly increased and I was able to retain that learning. The full-immersion gave me an immersion experience that made me confident in the language. I found that the course is somewhat limited in its scope because it lacks, sentence building techniques, tenses and idioms. Learning grammar and vocabulary can be boring but Transparent Portuguese (Brazilian) Premium Edition makes it fun and comprehensive. Though many claimed that the program is not intuitive from the start, but I never had any problems with it. 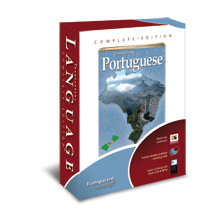 Transparent Portuguese (Brazilian) Premium Edition is easy to use which makes this product the choice of many language learners. It's perfect for people who want to learn Portuguese and have plenty of time to put into studying. Using it will enable you to build your Portuguese vocabulary faster and the quality of materials makes it an outstanding product. You may compare it with other Portuguese courses on the next page.